A number of people have proposed using a jet of high speed gas (steam or air) to stir up the flue gasses in a wood burning cookstove, so as to increase mixing, improve combustion, and reduce pollutants. The benefits are similar to adding a fan to a stove, but with less complexity and no need for electricity. Systems that I’ve seen in the past are batch systems that have a number of drawbacks. 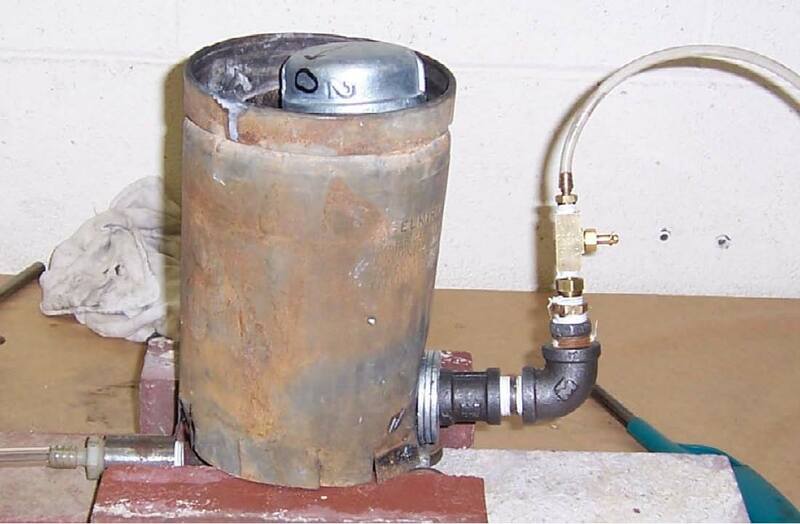 This report covers a continuous flow steam injector which I believe is much better. It was designed by a group of mechanical engineering students, with a few suggestions from me. The advantages of this system over previous batch flow systems are that this system runs continuously without being refilled, is controllable in terms of how much steam is being injected, and can not overpressurize as long as the valve is open. this project was when he asked me for ideas for student projects. The work was done in the winter and spring quarters, 2007. The scope of this project included developing a means to generate a high velocity jet of steam with a mass flowrate of less than or equal to 0.2 g/sec (which would take about 500 W of heat from the fire). They succeeded in doing this in a controllable simple system that can vary the steam flow from much less than 0.2 g/sec to much more than 0.2 g/sec. The scope of the project did not include figuring out what is the optimum amount of steam to produce, nor how to best utilize the jet of steam, since these are specific to the design of the remainder of the stove. The report given here should be taken as a starting point. In my opinion it presents a good basic idea that can be taken and developed in more detail by others, possibly with significant changes. I believe the system could be made much simpler and less expensively than the students imply. A better quantitative analysis could be done using simple tools and techniques. The report was written as part of the requirements of the class, and is therefore written in the style of a class report rather than in the style of a technical paper.